Measures spatial autocorrelation for a series of distances and optionally creates a line graph of those distances and their corresponding z-scores. Z-scores reflect the intensity of spatial clustering, and statistically significant peak z-scores indicate distances where spatial processes promoting clustering are most pronounced. These peak distances are often appropriate values to use for tools with a Distance Band or Distance Radius parameter. Z-score peaks reflect distances where the spatial processes promoting clustering are most pronounced. This tool can help you select an appropriate Distance Threshold or Radius for tools that have these parameters, such as Hot Spot Analysis or Point Density. The Incremental Spatial Autocorrelation tool measures spatial autocorrelation for a series of distance increments and reports, for each distance increment, the associated Moran's Index, Expected Index, Variance, z-score and p-value. The values are written as messages at the bottom of the Geoprocessing pane during tool execution. You may access the messages by hovering over the progress bar, clicking on the pop-out button, or expanding the messages section in the Geoprocessing pane. You may also access the messages for a previously run tool via the Geoprocessing History. Optionally, this tool will create a PDF report file with a graphical summary of results. The path to the report will be included with the messages summarizing the tool execution parameters. Clicking on that path will pop open the report file. When more than one statistically significant peak is present, clustering is pronounced at each of those distances. Select the peak distance that best corresponds to the scale of analysis you are interested in; often this is the first statistically significant peak encountered. The Input Field should contain a variety of values. The math for this statistic requires some variation in the variable being analyzed; it cannot solve if all input values are 1, for example. If you want to use this tool to analyze the spatial pattern of incident data, consider aggregating your incident data. When chordal distances are used in the analysis, the Beginning Distance and Distance Increment parameters, if specified, should be given in meters. If no Beginning Distance is given, the default value is the minimum distance for which each feature in the dataset has at least one neighbor. This may not be the most appropriate beginning distance if your dataset includes locational outliers. If no Increment Distance is given, the smaller of either the average nearest neighbor distance or (Td - B) / I is used, where Td is a maximum threshold distance, B is the Beginning Distance and I is the Number of Distance Bands. This algorithm ensures calculations will always be performed for the Number of Distance Bands specified and that the largest distance bands won't be so large that some features have all or almost all other features as neighbors. If the Beginning Distance and/or Increment Distance specified will result in a distance band that is larger than the maximum threshold distance, the Increment Distance will automatically be scaled down. To avoid this adjustment you can decrease the Increment Distance and/or decrease the Number of Distance Bands specified. It is possible to run out of memory when you run this tool. This generally occurs when you specify a Beginning Distance and/or Increment Distance resulting in features having many, many neighbors. You generally do not want to create spatial relationships where your features have thousands of neighbors. Use a smaller value for the Increment Distance and temporarily remove locational outliers so that you can start with a smaller Beginning Distance value. Instead of running the analysis on all features, select features in a representative portion of the study area and run the analysis on just those features. Take a random sample of features from the dataset and run your analysis on just those sampled features. Distances are always based on the Output Coordinate System environment setting. The default setting for the Output Coordinate System environment is Same as Input. Input features are projected to the output coordinate system prior to analysis. The optional Output Table will contain the distance value at each iteration, the Moran's I Index value, the expected Moran's I index value, the variance, the z-score, and the p-value. A peak would be an increase in the z-score value followed by a decrease in the z-score value. For example, if this tool finds the following series of z-scores for 50, 100, and 150 meter distances, 2.95, 3.68, 3.12, the peak would be 100 meters. The optional Output Report File is created as a PDF file and may be accessed from the messages found at the bottom of the Geoprocessing pane. On machines configured with the ArcGIS language packages for Arabic and other right-to-left languages, you might notice missing text or formatting problems in the PDF Output Report File. These problems are addressed in this article. When no peak z-scores are identified, both the first peak z-score and maximum peak z-score derived output parameters return a blank. 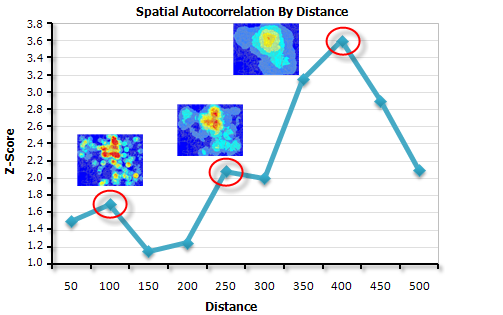 The feature class for which spatial autocorrelation will be measured over a series of distances. The number of times to increment the neighborhood size and analyze the dataset for spatial autocorrelation. The starting point and size of the increment are specified in the Beginning_Distance and Distance_Increment parameters, respectively. The distance at which to start the analysis of spatial autocorrelation and the distance from which to increment. The value entered for this parameter should be in the units of the Output Coordinate System environment setting. The distance to increase after each iteration. The distance used in the analysis starts at the Beginning_Distance and increases by the amount specified in the Distance_Increment. The value entered for this parameter should be in the units of the Output Coordinate System environment setting. The table to be created with each distance band and associated z-score result. The PDF file to be created containing a line graph summarizing results. The following Python window script demonstrates how to use the IncrementalSpatialAutocorrelation tool. The following stand-alone Python script demonstrates how to use the IncrementalSpatialAutocorrelation tool.